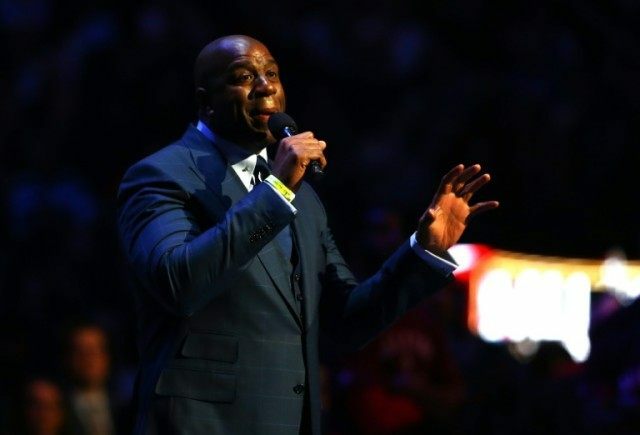 Los Angeles (AFP) – Los Angeles Lakers great Magic Johnson led the plaudits to Kobe Bryant on Wednesday as the NBA icon prepared to bring the curtain down on his 20-year career. In a heartfelt open letter posted on his website, Johnson wrote that Bryant will be remembered amongst the elite pantheon of the greatest players ever. “Through your commitment to success, outstanding work ethic, and winning attitude, each year you perfected your abilities beyond expectation,” Johnson said. “You are an example to your teammates and fans all over the world through your extraordinary achievements on the court and extensive philanthropic efforts off the court. Johnson said he had taken delight in watching Bryant as a fan of the Lakers. “I marveled at the skills and loved the energy you brought to the game wearing that purple and gold uniform,” Johnson said. “All you cared about was winning games and championships and that’s why so many people love you. Bryant will end his career at the Staples Center in Los Angeles on Wednesday in front of a sell-out 18,000 crowd. Ticket prices for the game have hit record levels, with one fan paying $27,500 each for two courtside tickets according to the StubHub exchange.